Bypassing Facebook Security Question to crack Password! Another major security flaw on Facebook that Allows you to Bypass Security Question of your Friend and Reset the password with the Help of 2 more Mutual Friends has been discovered. The flaw is actually a feature that can be easily abused to hack your friends Facebook account by going through password reset process. This hidden password reset feature allows you to bypass the security question (which is asked on password reset page) and reset the password with the help of 3 Friends (possibly your fake accounts). Note: If you haven’t set your Security Question yet, then Please do not Bother to set any because its useless. The Most Important thing you got to do now is “Register your Mobile” on Facebook if you haven’t yet. If you have had already chosen your Security Question, then please read this post carefully to know how you can protect yourself from this attack. Everyone knows that most of the websites prompt their users to select security question, so that in case you forget your password, you can easily reset it. However when it comes to Facebook, things can become worst if you have set your security question. Recently i was just playing with Facebook’s password reset process and just found out that there is a secrete way to Bypass Facebook’s Security Question and get straight to password reset process. Go to Facebook’s Forgot password page and enter your friends email or Full name to search his/her linked account. Remotely track and control activity on smartphones – Monitor Call logs, text messages, Social networking sites, whatsapp messages & more . Facebook will now search for appropriate account that is associated with the information you provided. Select you account and Click “This is My Account”. 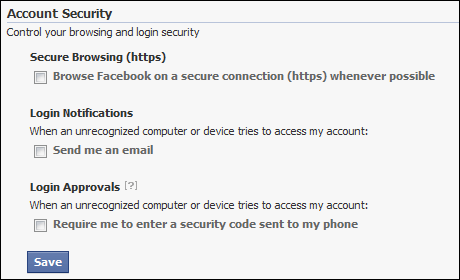 Next Facebook will present to you the available options to recover your account. Now Click “No Longer have access to these?” and Facebook will now ask for new email address, so that it can send you messages regarding recovering of account password. Enter the email address and click Submit and as expected there is also another layer of security called “Security Question”. Now here comes the Critical vulnerability.. Interestingly If you type-in wrong answers three times in a row, you can Just Bypass this layer of security and you will see another interesting way to get reset account password with the help of 3 friends. As you can see above there are Three Steps involved in the the recovery process. First you will have to select 3 Trusted Friends for the help (If you are trying to hack your friends password, then you may select yourself and 2 more friends). 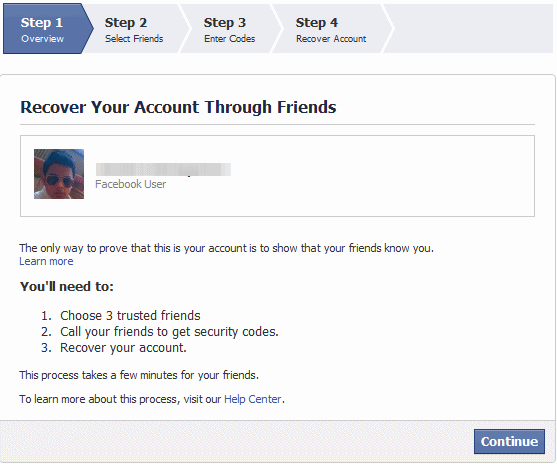 please select Trusted Friends only because any of the Friend can potentially gain access to your friends Facebook account through standard password recovery Process. Once you Select 3 Trusted Friends of yours, Facebook will then email secret security codes to each of your selected Friends. Now your Job is to call your Friends and Get the 3 Security codes. Once you collect the 3 security code, enter them one by one in step 3. Finally Facebook will then allow you to reset your password through standard email recovery process. Important: Note that the Victims account will be locked for 24 hours after this password change and also the user’s old email address will receive a notification of the password change including the names of the 3 friends who were involved in this password change. Yes you guessed it right, you could also create 3 fake profiles and add them to your victims friends list first and then carry out this hacking Process. How do i Protect Myself from This Attack ? As you can see we easily Bypassed Facebook’s Security Question, There is No use of setting any security Question. If you haven’t Selected any Security Question on Facebook, Just sit back and hang loose , don’t Bother to set any. Just Register your Mobile on Facebook. Its Important that you Register your Mobile on Facebook. Unfortunately it is not possible to update or Remove your account’s security question once you have added one. So guys If you have had already added Security Question in your Account Settings, You are at Risk. So to avoid this attack, you will need to Update your ‘Account Security‘ In Account Settings. Never Friend or Accept friend requests from people you don’t know. If by chance anybody resets your password through this attack, your email address will receive a notification of the password change including the names of the 3 friends who were involved in the password change. You will then have only 24hrs to act on it, So Always Check you email everyday. In case if your planning to go for a vacation, Never Update your Status saying you “I will be offline for some days” or similar to that. Your vacation is enough for a hacker to compromise your account. Do Share this Post with your Friends and Make them Aware of this vulnerability!